MelodySpeak is a multi-media, music-based system for learning beginner-level Spanish. 5 original songs connect elementary Spanish speech with genuine Latin music styles, helping students take advantage of the natural relationships between music and language to learn more quickly, reliably and enjoyably. The full MelodySpeak system (best suited to grades 1-5) will consist of a picture book and aural training materials that teach each song from "square one," starting with syllable-by-syllable pronunciation of each lyric, and progressing to full-song singing. In the process, students will acquire primer Spanish skills using the same powerful, sound-based methods as native speakers. Song list: 1—Múltiplos de Diez (The Multiples of Ten) 2—Estamos Aprendiendo Español (We are Learning Spanish) 3—Palabritas con Jota (Words with J) 4—Repetición (Repetition) 5—Sonido de Mi Voz (The Sound of My Voice) Contributors: Alberto “Cuquito” Reyes, percussion Yesenia Ruiz, vocals Asher Barreras, bass Antonio Herbert, flute Corey Paul, trombone Matt Mill, trumpet, engineer Justin Diaz, trumpet Alexandra Bodytko, saxophones Joe Sandoz, engineer Jeff M. Brown, piano, engineer Anton "TC" Castillo, piano Written and produced by Jeff M. Brown. 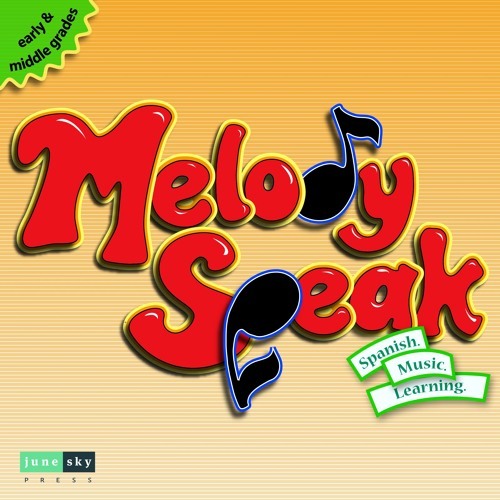 MelodySpeak description— Learn Spanish to a Latin beat! Set sail on a multimedia cultural exchange in which language learning becomes filled with the spicy rhythms and tropical melodies of Spanish-speaking lands. MelodySpeak offers a revolutionary step-by-step system which brings Spanish alive with genuine Latin music. It shows students how to sing, speak and grow with confidence within one of the world's major modern cultures. A fun, challenging adventure awaits, no matter the student's level. Feel the fluency of Spanish, and express it with the exciting flair of Latin-style congas, pianos, flutes and shakers. MelodySpeak: sing a new song & speak your new language! Learn with MelodySpeak— -It's FUN—It uses the magic of melody to open new doors to foreign language. -It's EFFECTIVE—It uses structure of rhythm to lock in mastery of new vocabulary. -It's RIGOROUS—It provides never-before-seen depth of song teaching, down to the syllable level. -It's CULTURAL—It links Spanish words to the unique beauty of real Latin music traditions. -It's SIMPLE—It includes all expert instruction led by native speakers on CD/MP3. Just press PLAY. MelodySpeak Philosophy Statement— The true essence of spoken languages is sound. Consider that babies learning a first language will spend years working with the sounds of their native language before they ever read or write their first word. In the process they achieve a fluency and mastery of spoken ideas, all within the realm of sound. The MelodySpeak system puts this same natural, powerful approach in the hands of students learning Spanish. It takes advantage of the unique powers of melody and rhythm to give students the best possible foundation for a lifelong relationship with their new language: the sound foundation. Copyright June Sky Press. Users who like MelodySpeak: 5 Songs for Beginner Spanish in Latin music styles. Users who reposted MelodySpeak: 5 Songs for Beginner Spanish in Latin music styles.